Everyday Geographies: A view from the top! Are you new to coordinating geography? A view from the top! 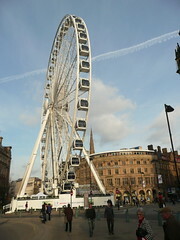 We went up on the Sheffield `Big Wheel' yesterday for the first time as we felt the weather was quite good. The aerial photos are on Flickr - not great images as the light was dodgier than I thought and the perspex exterior of the carriage was badly scratched. 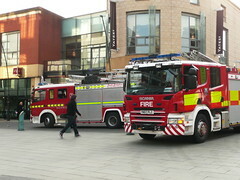 There was a whole lot of drama around Coles (John Lewis) (yesterday) with fire engines as well as a BBC mobile unit (which was on the spot by sheer coincidence). Apparently there was a small electrical fire in perfumery - info courtesy of the Sheffield Forum where you can find out much you want to know and very definitely a whole heap that you never needed to know - especially from anonymous writers.